Nothing says summer like fresh home-grown strawberries. Now potted organic strawberry plants are available shipped directly to your door. Our potted strawberry plants are already growing and are fully rooted in three-inch pots. They are ready to start producing boxes and boxes of luscious strawberries. Our day neutral ever-bearing Albion strawberries produce consistently throughout the production season. Albion has shown resistance to Verticillium wilt (Verticillium dahliae) and Phytophthora crown rot (Phytophthora cactorum). The fruit has outstanding flavor and attractive internal and external fruit color. This is variety that has done well throughout most of the US. What does an organic strawberry plant mean to you? It means from the very beginning these plants are grown in fertile, nourishing organic soil and that no chemicals are used in the growing, packing or processing of the plant or the fruit. 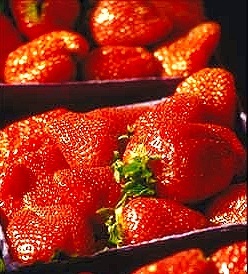 Commercial strawberry production is extremely dependent on the use of chemical herbicides and pesticides. Most strawberry fields are first treated with a chemical to destroy any pathogens that may interfere with that perfect strawberry and then covered with plastic to keep bugs and weeds at bay. The chemicals can be absorbed by the roots of the plant and taken up by the fruit. This chemical treatment is followed by more spraying to rid the plants of bugs or disease. The use of plastic causes a lot of soil erosion which depletes the soil and makes more chemical fertilizer necessary. And, since strawberries are mostly water, a lot of run off occurs during the watering process taking with it the nitrates and other chemicals found in these fertilizers into common water areas. And, since commercial growers usually start fresh each winter, the onslaught of chemicals and the preponderance of plastic waste is expansive. By growing an organic strawberry in an organic environment, you can truly enjoy one of life's little pleasures with full assurance that there are no hidden substances in or on your little ruby gems! A few growing tips for your strawberry success! Strawberries can be a bit ornery to grow. They have some very specific requirements and there are some helpful things to know about growing them. First and foremost is that they don't compete with weeds well. Second is that, in order to grow plump and juicy, they need plenty of water and nutrients plus excellent drainage. Their need for water is compounded by their shallow root system that can dry out easily. Third is that while the strawberry loves the water, the moistness is also very attractive to ground bugs like mealy bugs and earwigs. These little bugs like to hollow out homes for themselves in the berries. The abundance of water can also cause ripening fruit to rot where it touches the ground. Fourth is that the fruit is tastiest when it fully ripens on the plant. Unfortunately, this is also the stage the birds tend to come in and swipe them right out from under you. It might seem hopeless, but there are some simple solutions. Strawberries seem to grow better in raised beds or in containers. These can be filled with top-quality compost or potting soil which helps to encourage beneficial bacteria and earthworms. Raised beds containing quality topsoil can be filled with strawberries, mulched with compost (which adds to fertility), and covered with clean straw to help conserve moisture and keep the strawberries off the ground. Raised beds need only be a foot tall and two feet wide. Planting two rows of strawberries about 8 inches apart will provide a strawberry bonanza. Hanging baskets are ideal because the berries can hang in the air, which keeps the ground bugs away. If watering a hanging basket is a concern, any container can be used and placed atop walls or on blocks in the path of automatic sprinklers which keeps water levels more consistent. If it comes down to you or the birds, set up one of our motion detector sprinklers aimed at the strawberries. It will deter a lot of different kinds of critters that might be after your goodies. A row cover can also be used to deter birds and flying insects. These light-weight cloths let light, water and air through and are an inexpensive way to protect your crop. To encourage nice large plants, runners (also called daughters) can be pruned off during the first part of the growing season. These can be potted up and replanted in another spot. Also, if the plants have not yet reached a good size, the first flowers can be pinched out to encourage more leaf growth, which will mean more food for the strawberries later and more fruit for you. Fertilizing with an organic all purpose fertilizer during the first phase of growth and an organic bloom fertilizer once the flowers start showing up really helps to keep the plants vigorous and healthy. Healthy plants have fewer disease problems and attract fewer insects. Strawberries are hardy to Zone 4. Zones 4 and 5 may benefit from a mulch applied to the strawberries after they go dormant. Straw is typically used and is applied about 2 inches thick over the tops of the plants. This can be removed in the spring if it has not degraded enough for the plants to poke through. For more information on growing strawberries visit ATTRA. Wash, hull and slice strawberries. Finely chop herbs. Mix strawberries, herbs and wine in a clean glass container. Close container with a tight fitting lid. Shake mixture well. Refrigerate for 2 days, shaking it occasionally. Strain the wine into a pitcher through a sieve lined with a cloth towel. Serve cold. Recipe courtesy of the PastryWiz. 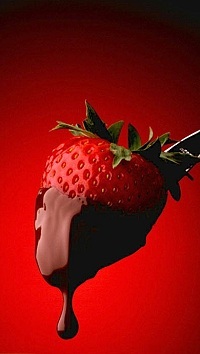 Visit their site for more great strawberry recipes, including tips for making your own chocolate dipped strawberries. A picture is worth a thousand words. Here a big bowl of freshly picked plump Marionberries are ready for the table. 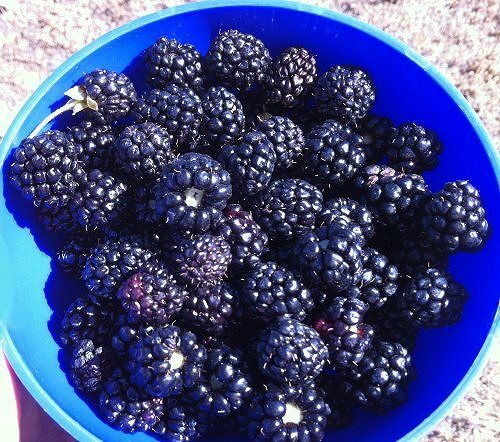 Chances are if you are buying blackberries at the store they are actually Marionberries. Now you can grow your own. Marionberry vines can get out of hand pretty quickly so it is important to take proper care of your berry plant. Marionberries will root and spread if you don't grow their canes up on a trellis. This can cause a huge mess and make it difficult to harvest the berries. A sturdy trellis with two or three rows of stiff wire strung between helps to get them off the ground. Fruiting canes should be cut out after harvest and new canes should be thinned to be spaced about six inches apart. These will be trained up the guide wires as the canes grow. Greenish pink round berries are sweet and prolific. This gooseberry does have some thorns but not as many as other varieties. It is hardy from zone 3 and blooms in late spring. Berries are usually ready by mid June here. It gets about four feet tall.